While we often talk about oversteps regarding copyright protectionism and lawsuits in these here pages, it's not as though there aren't understandable disputes that exist. Likewise, while we often detail bad actions by aggressors on copyright issues, it's not as though those on the defending side of that coin are always virtuous in the way they handle the dispute. The issue of game and mobile application cloning serves as a good ecosystem to show plenty of examples of both, with the latest dust-up between Riot Games and Shanghai Moonton Technology offering a specific look at how a party on the defense from a copyright claim can get everything wrong. First, some background. Riot Games recently filed a lawsuit against Moonton for copyright infringement over three Moonton games: Mobile Legends 5V5 MOBA, Mobile Legends: Bang Bang, and Magic Rush: Heroes. 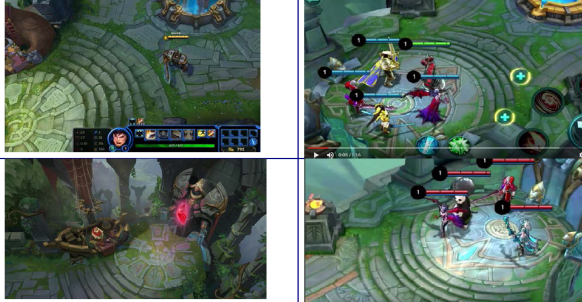 A cursory look at the evidence Riot Games offered up in the filing sure makes it look like Moonton was simply cloning League of Legends, from title screen to in-game design. And there's a lot more images you can compare in the link. The point is that nobody is going to look at this lawsuit and think Riot Games is crazy for filing it. There is enough cloning going on here to make even the most sympathetic pause. By now you're probably wondering why this post is appearing on Techdirt at all, as we don't make a habit of posting about seemingly legitimate intellectual property lawsuits. Well, you're reading this because we certainly do write posts about companies that attempt to lash out at the press and threaten them with lawsuits for covering them critically. And that's exactly what Moonton decided to do in the face of the lawsuit. Official Statement: Recently some media have published negative and unreal reports against Mobile Legends. 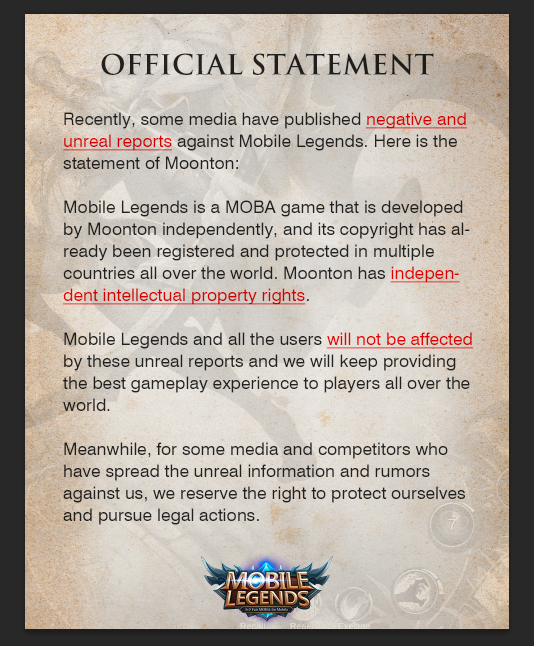 Here is the statement of Moonton. Mobile Legends is a MOBA game that is developed by Moonton independently, and its copyright has already been registered and protected in multiple countries all over the world. Moonton has independent intellectual property rights. Mobile Legends and all the users will not be affected by these unreal reports and we will keep providing the best gameplay experience to players all over the world. Meanwhile, for some media and competitors who have spread the unreal information and rumors against us, we reserve the right to protect ourselves and pursue legal actions. Vague threats against the press for reporting on the lawsuit is simply not a good look. It also serves to put this into Streisand Effect territory, with much more coverage on the lawsuit due to Moonton's response than would otherwise have existed. References to "unreal information" and "rumors" seem particularly silly, given that there is a very real and concrete lawsuit currently filed against the company, one which the press is certainly going to report on, whether Moonton likes it or not. So, feel free to debate the validity of Riot's lawsuit all you want, but this is a terrible response from Moonton. I don't really get this. Riot has been after everyone's asses for a long time now. Why do they really fret over their "LoL" so much, provided LoL itself is a rip-off of the old DoTA game (Yes I know the internet bashing for me is now imminent). But League of Legends is based on the same platform as DoTA and also, "most" of the characters and abilities are similar. So, if you have taken the idea from someone and you're fine on your conscience with it, let others take a dig at it too. Really, selfish people.